Lay Trainings Continue to Build Universe of First Responders. Deer Park, NY - April 23, 2014 - County Executive Steve Bellone, New York State Senator Phil Boyle, and the Suffolk County Department of Health announced a partnership to host an Opioid Prevention Training Program to train the general public on the use of the heroin antidote Narcan. Held at the Deer Park Fire Department on Tuesday, April 22, the Suffolk County/New York State sponsored prevention class trained 185 lay people as part of a larger effort to build and train a universe of future first responders. To date, Suffolk County Department of Health conducted 12 training sessions and supplied Narcan kits to 208 non-traditional responders, including the general public, village and town police departments. Non-traditional first responders include the Shelter Island PD, Suffolk County Probation, Northport Village PD, Nissequogue PD, Asharoken Village PD, Ocean Beach PD, and Town of Smithtown Public Safety. Additional classes are being scheduled for Southampton Town PD, East Hampton Town and Village PDs, Sag Harbor PD, Suffolk County Sheriffs Office and Southold Town PD. Tuesday’s announcement concluded with a live demonstration of the administration of the heroin antidote Narcan by Suffolk County Director of EMS, Bob Delagi. 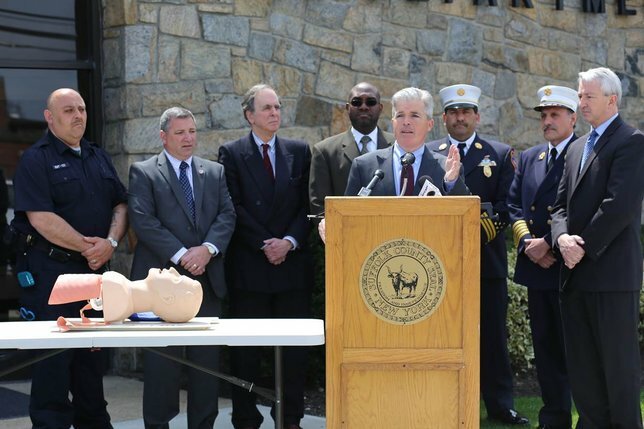 For more Suffolk County news, as well as video footage and photos of the Narcan announcement, visit www.facebook.com/stevebellone. Subject: LongIsland.com - Your Name sent you Article details of "Boyle, Bellone Partner to Launch Opioid Overdose Prevention Training Class"